Marina/Mooring Review forum - good idea? Afternoon all I think I am in the market for a new 12v fridge, in your opinion does one manufacturer stand out in respect of quality build and reliability. Currently I have a 240V but as will be off grid for months on end this year, hence considering moving to a less energy thirsty beast. Opinions please. A very sad day at the marina today. A visitor boat came in for diesel and while the boater was making full use of the toilet facilities, Three large dogs ran out of control from the boat and set about our resident swan family. Sadly, one of the young swans was killed in the attack. If you have dogs when you visit, keep them on a lead in our marina, or lock them inside the boat. OK to empty cassette in towpath hedge? I do not know the depth of the pits as yet, as all I have been told is that the issue was discovered at a previous survey by the brokers, and the potential purchasers walked away. The tube is not in a watertight compartment as wiring has been put in from the o/s of the watertight area which means there is no watertight integrity. My survey will give me the exact detail. Hello folks I am a new to the world of narrowboating, and I find myself with this situation. 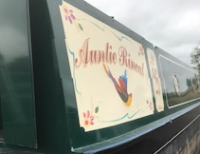 I Have found a boat which I very much like but has previously had a survey which stated there was pitting inside the bow thruster tube, this is to be confirmed by my survey. The previous potential buyers of the boat walked away at this point. Much advice has been given, some similar to the above, or that it is possible to spot weld the area within the tube thereby making good the tube, or that the tube will have to be replaced and I will be looking at a very big bill. Advise would be welcome. As a secondary question would this if the pitting be so severe be a safety issue.. The question is asked as if there is no point in spending on a full out of water survey I might as well save my money.